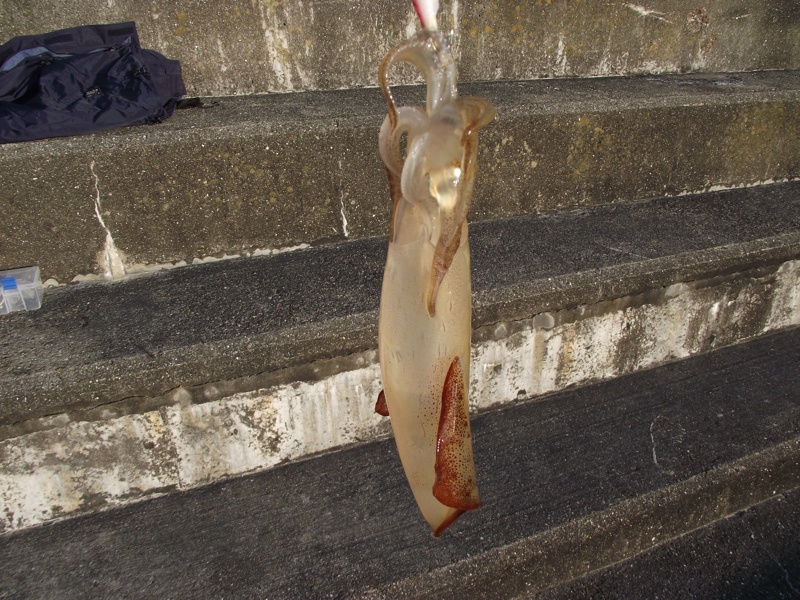 I was determined to bag some more squid, so with that in mind, I headed off to Brighton Marina on Friday morning, nice and early. Got onto the East arm at about 7am and it was virtually deserted. 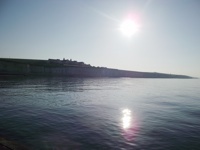 Absolutely beautiful morning, bright sunshine, no wind, flat calm, clear sea – perfect. I was on a dropping tide but decided to start in bay 1 with the intention of moving up to the higher numbers as the tide fell. Standard set up of a sliding float rig with TronixPro squid jig at the end of the hook length. I plumbed the depth to make sure the jig was settling just right and then had the first proper cast of the morning – well, more of a gentle under arm lob really, putting the float out at about ten yards out. I had a quick coffee then returned to the rod to see what the drift was like. The float had come in closer, so went for another lob. As I retrieved the gear, the rod tip suddenly dipped and the line went taught. A squid had taken the jig as it was rising and was soon on the deck. 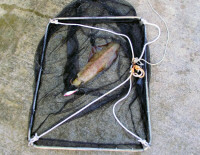 I quickly put the float back out and then tended to the catch. Same as the other day, a relatively small one compared to what I’ve normally had off the arm. Would still make a decent lunch though, so it was quickly dispatched and tucked away. The rest of the morning was slow, I mean really slow, no more interest shown in the jig, even after having moved up to higher bays. Looked like they’d all done a runner and disappeared. I gave it until around mid day and then decided I was on to a loser for the day, plus I needed time to get cleaned up and ready for work that evening anyway, so packed it all in and headed off home. Lovely day to be out, I just love those early mornings when it’s dead quiet before the masses turn up and you have the place to yourself and pretty much go where you want. I had thought about going today but having been to the marina on previous bank holiday Mondays, I decided I couldn’t be arsed fishing elbow to elbow with the inevitable tinsel chucking. Besides which, work beckons anyway, so it was pretty much a no go anyway. After a minor success at the squid competition, I thought I’d make use of the decent weather and take Alex along for a shot at the squid. So we were up early the next day and shot off to Brighton Marina before the crowds descended. We were on the East arm by about 8am and shortly after, the float was in the water. I’d set up a 9′ sea spinning rod with a 5000 size baitrunner for Alex and this seemed a perfect match for him, nice and light, easily controlled but with enough strength to handle a squid. It was a glorious morning, bright sunshine, clear water and no wind. It would have been perfect apart from the fact we were on a very low tide and there was hardly any depth at the spot I wanted, so aimed for a higher bay but even then, we would have a wait until there was sufficient depth to fish. 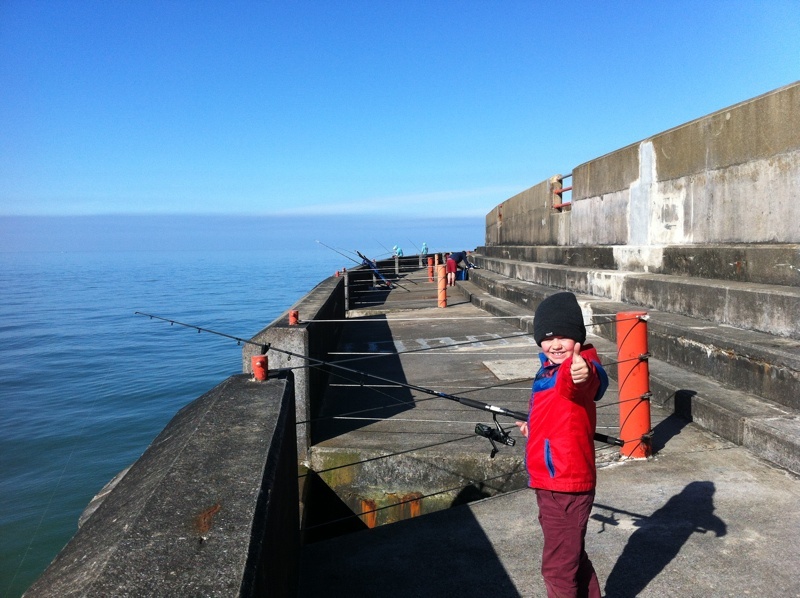 I set up the gear and after a few short refresher lessons on casting and explaining that it was different from casting off the beach, Alex set about with gusto. There were the odd misfires but on the whole, he did pretty well and was soon into his stride. After a couple of hours, the breeze began to pick up a bit and it was soon proving difficult for Alex to cast into the wind. There had been no signs of interest on the jig, so I set another rod with the same sliding float rig, only with a size 2 hook replacing the jig. 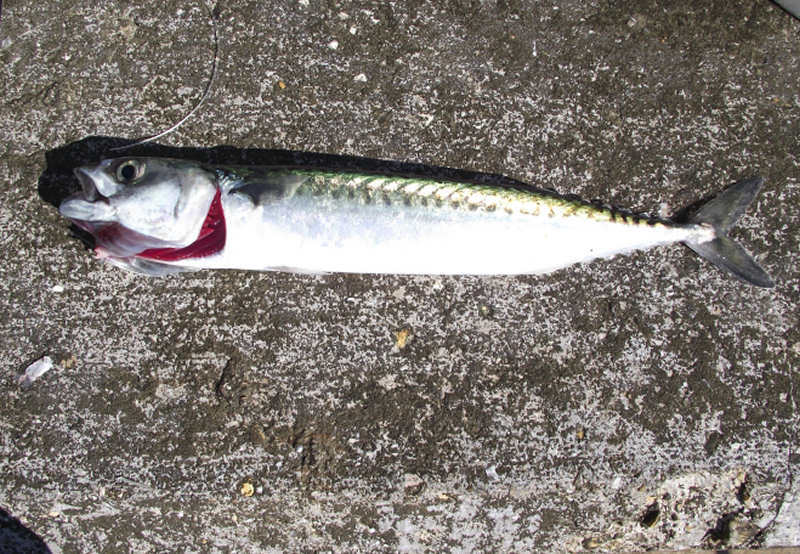 I baited with small slivers of mackerel and had that one out in the water too. It soon began too feel like a hopeless mission on the squid front and nothing was showing any interest in the floated bait either. We decided it would be better to pack up and go home to cook the squid I’d caught the previous day. All in all, a nice to day to be out and although nothing was caught, Alex at least had an opportunity to practice his casting. The bait cutting should see him in fine form if he ever decides he wants to be a pathologist. Well, eventually it happened, after previous postponement due to weather, the 6th. All England Squid Championship, a charity and fun day, raising funds for the R.N.L.I. got under way at Brighton Marina on Saturday 27th April. As usual, the event was organised by ‘Fishyrob’ and sponsored by George Cunningham of TronixPro. Thanks also to Dave at The Tackle Box for allowing the use of the arm for the event. I believe, in total, some sixty eight fools gathered at the East arm cafe, ready to hand over the entrance cash and draw lots as to who fished where. In contrast to previous draws at this event, and against all the odds, I managed a low number and drew to fish at bay 4, so only a short walk away. I normally draw numbers so high, even Carol Vorderman would struggle to count that far. And so it was I made the short distance to my slot and started tackling up – my usual set up, a 12′ 2½lbs carp rod, 5000 size bait runner reel and a simple sliding float rig with the TronixPro jig at the end of the hook length. I was full of optimism, watching the float in anticipation just, waiting for it to gently slide under as a tentacled creature took the jig. Hmmm… the anticipation continued but not quite at the levels of earlier. The hours ticked by and it wasn’t until we were nearing the end of the competition when the first squid started coming aboard. My high hopes and optimism were fading quicker quickly and I was staring at the prospect of a blank session. It was good to hear the shouts going up and seeing the squid coming in – at least it showed they were there – but not near my jig it would seem! I was into the last hour when I saw the float dip slightly before disappearing – first thoughts were that I was stuck in the weed but… there were signs of life on the other end. Rob kindly began netting the beast for me. I have to say, his attempt at humour almost had me taken in with his cry of “Sorry Vic, it’s gone, dropped off”. 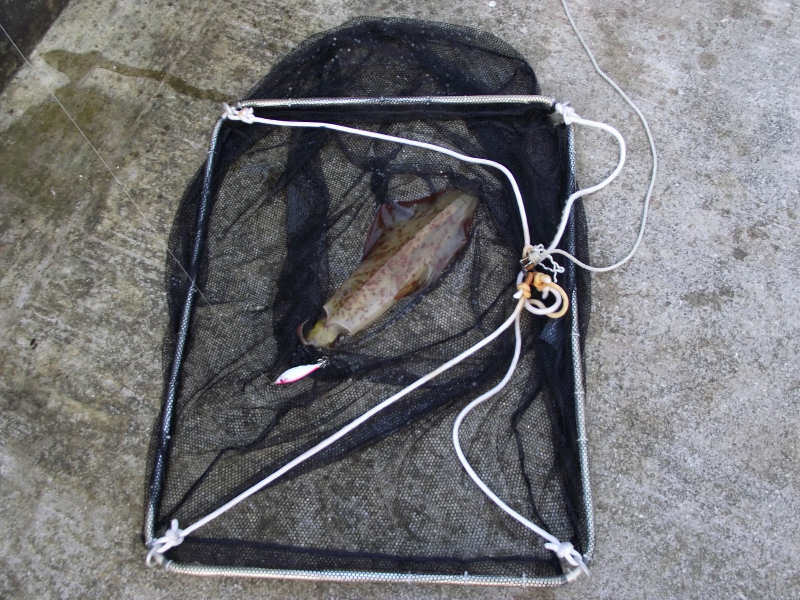 I very nearly let out a string of obscenities but in time, I saw my catch safely in the net. It wasn’t huge and it certainly wasn’t in with a chance of the trophy but it had saved the blanked and would be extremely tasty for lunch the following day. It wasn’t long before the shout went up that the competition was over and we all began the packing up, clearing up and trudging off the arm. I didn’t stay for the after comp knees up but opted to get home, shower and take a rest. The standing up for that length of time certainly do my back any favours. The pursuit of squid has been a bit of a compulsion with me this year, having fished a few times and only one dropped one to show for it; so it was an early start this morning in the continuing quest. 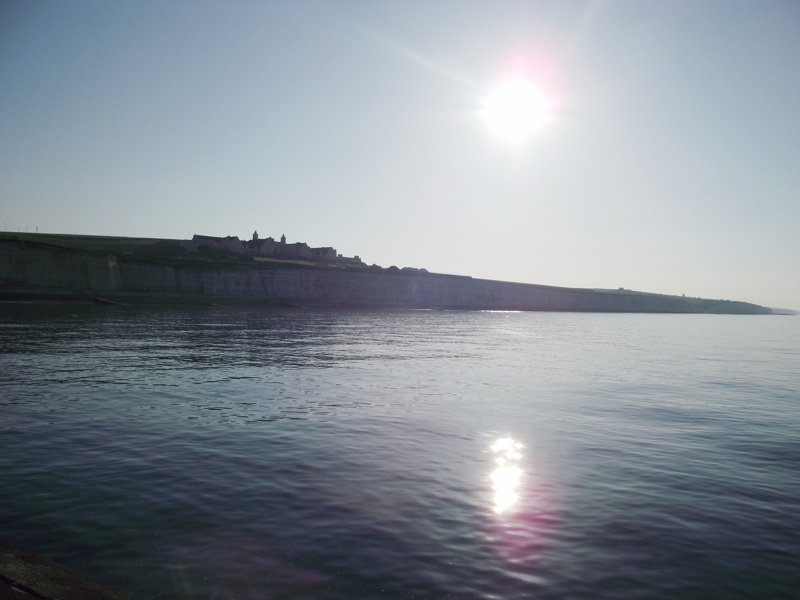 Brighton Marina was the chosen venue and as it was forecast that the wind would be from the North East, I decided that the East arm would be a good bet, fishing in the higher numbered bays on the the straight, which should offer some protection. I arrived on the arm at about 6.15am expecting to have to wait until Frank turned up to unlock the gate – as it was, he’d obviously been suffering from insomnia, as he was already on the wall with the gate open. After the usual chin wag, I trudged off and settled in bay 48. Flat sea, only rippled by the light breeze and only slightly coloured – conditions looked good. I set up the carp rod with a sliding 1¼oz float, plumbed the depth, then attached a pink Tronix jig to the business end and had the whole lot in the water by about 6.30. I had a quick coffee while the float was working in the slight left to right current of the ebbing tide. High tide had been at 6am and the hardest current had already petered out. I didn’t have to wait long before I saw the float slowly disappear in the characteristic squid take. I slowly eased it towards the wall, holding the rod in my left hand while using my right to deploy the drop net (wasn’t going to make the same mistake I did last time and lost one trying to swing it in). With the net now just under the surface, I gently steered the squirting and inking beast closer and then over the frame and safely into the middle of the net – a quick heave and the critter was decked. My first of the year – woohoo! I continued to fish the current, working the float but the stiffening breeze made it difficult to control. I sent a brief text message to Frank asking about the conditions on the West arm and his reply confirmed to me that a move was probably in order. I then phoned Fishyrob who said the conditions were much better over that side with better shelter from the breeze. I trudged back to the car and made the very short journey over to the other side of the marina and was shortly onto the West arm and into a slot next to Rob and a client (sorry, didn’t catch your name), who had already decked his first squid. Although the water was calmer over this side, there was very little in the way of movement, with the float just staying where it landed. The fishing proved to be very slow with nothing added to my tally. Rob’s client on the other hand, decked another one while I was there, By about 11.30, I’d had enough – my back was screaming and I really needed to get home. So final result was just the one for me – but at least I’d broken my duck and my optimism has now been renewed. Not a very inspiring post is this, in fact downright depressing as far as squid go. In an effort to bag my first of the year, I got down to Brighton Marina nice and early on last Wednesday morning, to get a decent space place to hunt for squid. I resisted the temptation to sit in bay 1 and opted instead to get out in the higher numbers where the squid should appear on the ebbing tide. I eventually got myself settled in bay 36, I think it was and set up the carp rod with a sliding float rig and a Tronix green jig. The water was still quite low and had a fair bit of time until the 11.30 high water. I set about working the jig anyway, more in a bubble of optimism than any real hope. The water was very green and you could see the clouds of rot it in, although this did lessen a bit with the rising tide. 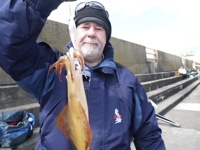 I was desperate to bag a squid, as I knew I wouldn’t be fishing the following day as it was my birthday and had other plans set. 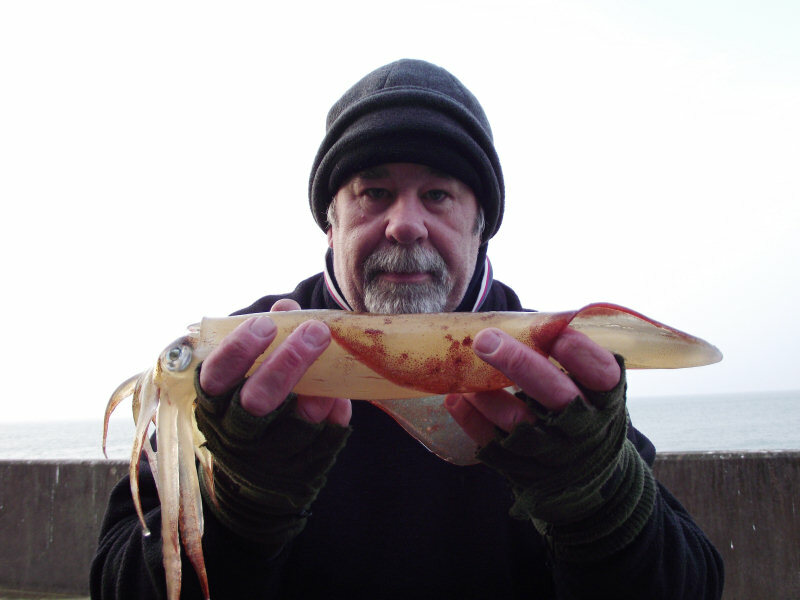 In mad bid to drag a tasty cephalopod from the sea, let the float do its thing while I set up another rod equipped with a large Jarvis Walker Razorback weighted jig which I then worked ‘Egi’ style along the bottom. It seemed that no matter what I did, I just couldn’t tease one out. I even resorted to chucking feathers out to avoid a total blank when I saw a few mackerel coming out a few bays up. Even then, I only managed a single fish. I eventually called it a day at about 2pm – three hours after high water with just the single mackerel to show for my efforts. Not a good day catch wise but at least the weather wasn’t too bad.